"Faulty Intel Source 'Curve Ball' Revealed"
Washington, DC, November 5, 2007 - CBS News’ 60 Minutes exposure last night of the Iraqi agent known as CURVEBALL has put a major aspect of the Bush administration’s case for war against Iraq back under the spotlight. Rafid Ahmed Alwan’s charges that Iraq possessed stockpiles of biological weapons and the mobile plants to produce them formed a critical part of the U.S. justification for the invasion in Spring 2003. Secretary of State Colin L. Powell’s celebrated and globally televised briefing to the United Nations Security Council on February 5, 2003, relied on CURVEBALL as the main source of intelligence on the biological issue. Today the National Security Archive posts the available public record on CURVEBALL’s information derived from declassified sources and former officials’ accounts. While most of the documentary record on the issue remains classified, the materials published here today underscore the precarious nature of the intelligence gathering and analytical process, and point to the existence of doubts about CURVEBALL’s authenticity before his charges were featured in the Bush administration’s public claims about Iraq. 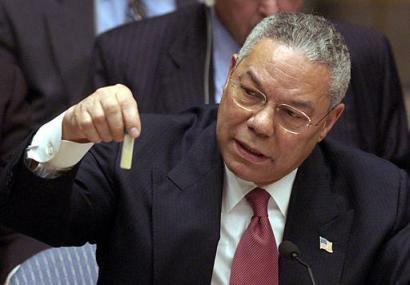 On February 5, 2003, Secretary of State Colin Powell made a dramatic presentation before the United Nations Security Council, detailing a U.S. bill of particulars alleging that Iraq possessed weapons of mass destruction that threatened not only the Middle East, but the rest of the world. Unbeknownst to the public at the time, a key part of the U.S. case—relating to biological weapons—was based on the direct knowledge of a single agent known as CURVEBALL, whose credibility had previously been cast in serious doubt. CBS News’ 60 Minutes is now reporting the identity of the agent as one Rafid Ahmed Alwan, (Note 1) who appeared in a German refugee center in 1999 and brought himself to the attention of German intelligence. CBS News describes Alwan as “a liar … a thief and a poor student instead of the chemical engineering whiz he claimed to be.” (Note 2) If accurate, the CBS report raises even more troubling questions about the basis for the Bush administration’s decision to go to war in Iraq, as well as more general considerations about the relationship between intelligence and the policy process. By way of background to this latest revelation, the National Security Archive is reproducing the existing public record on CURVEBALL as derived from declassified records, official inquiries and former officials’ accounts. The documents below are a small fraction of the full record, which remains almost entirely classified. The National Security Archive has filed Freedom of Information Act requests for these still-secret materials and will post them as they become available. The public record as of this posting, while miniscule, nevertheless has an important story to tell, the centerpoint of which is Powell’s speech, which represented the Bush administration’s most powerful public argument leading to the decision to invade Iraq. This process began on January 29, the day after President George W. Bush’s State of the Union address, which had also included the claim that Iraq possessed mobile biological weapons plants. Unknown to the State Department reviewers, CIA officers elsewhere were simultaneously in an uproar over the CURVEBALL material. (Note 6) In answer to queries from CIA manager Margaret Henoch, the German intelligence service, which had Alwan in their charge, refused to certify the CURVEBALL data and denied CIA access to the original transcripts recording the conversations. Thus, the agency never had direct contact with CURVEBALL, who in fact had only been seen once by an American, an official of the Defense Intelligence Agency (DIA), who had harbored doubts about the man. The CIA was working strictly from DIA translations of German texts. Henoch feared using third-hand information that contained transliteration problems. Her suspicions were further aroused after it became clear the German service itself doubted CURVEBALL’s reliability. The intelligence backstory needs a brief sketch here because it bears on the question of CURVEBALL’s veracity. Alwan arrived in Munich from North Africa in November 1999, requesting political asylum. That automatically led to interviews with authorities and vetting by the German foreign intelligence service Bundesnachrichtendienst (BND). It was the BND to whom he told his tale of Iraqi weapons plants. That service in turn shared its reporting with the DIA in the Spring of 2000. The DIA subsequently shared the information with CIA. According to various sources, by late December the CIA was making official inquiries of the BND as to whether the U.S.—and the White House—could use the material. Drumheller’s aide, Margaret Henoch, expressed her own concerns in an e-mail circulated within CIA headquarters. Deputy Director of Central Intelligence John McLaughlin ordered subordinates to meet and reconcile their positions on CURVEBALL and his information. Analysts at CIA’s prime analytical unit in this area, the Weapons, Intelligence, Nonproliferation, and Arms Control Center (WINPAC) criticized the Directorate of Operations for questioning this information. WINPAC had already used it for its contributions to the October 2002 National Intelligence Estimate on Iraqi weapons programs and by now had a stake in CURVEBALL’s veracity. (Note 8) The meeting resulted in an impasse between CIA officers from the different units. Division chief Drumheller raised the CURVEBALL credibility issue again in January after seeing a draft of the Bush State of the Union address with its claim of Iraqi mobile weapons plants. According to his account, he spoke to colleagues at the CIA’s Counterproliferation Division, wondering what data other than the exile’s reporting WINPAC might have to back such a claim, only to be assured there was none. Drumheller had Henoch prepare an e-mail for McLaughlin’s executive assistant summarizing the problems with the CURVEBALL information, and notes that McLaughlin later queried WINPAC’s senior analyst on this subject about the questions raised. Drumheller indicates that the CIA deputy director received “robust assurances.” (Note 10) Drumheller also told the Silberman-Robb Commission that he had attempted to delete the passage about the mobile weapons plants from the State of the Union speech. The sessions at CIA headquarters where the Powell speech itself was vetted involved both John McLaughlin and George Tenet, as well as McLaughlin’s executive assistant, who is recorded at one point asking for more assurances from CIA’s Berlin station chief on the CURVEBALL material. Throughout the period, Berlin’s responses were instead cautionary. Finally it all came down to the night before Powell’s speech. Powell and Tenet were already in New York engaging in final rehearsals. That night there was a phone call between Tenet and Drumheller. Both individuals at least agree that a conversation took place, though Tenet remembers an evening call where he merely asked for a phone number, while Drumheller says he specifically warned Tenet against using the CURVEBALL material and the director replied something like, “yeah, yeah.” (Note 13) The next day Powell went ahead with the allegations. Tenet had not taken any of CURVEBALL’s claims out of the speech. Whatever else may be the case, it is clear that questions were raised about CURVEBALL—and they surfaced before his information was used to buttress the case for war with Iraq. The statements by CIA senior officers Tenet and McLaughlin are difficult to reconcile with the other evidence. At a minimum they failed to resolve questions regarding CURVEBALL’s authenticity, and permitted Powell to step onto a world stage with flimsy evidence. Worse, more doubts about this intelligence were expressed immediately after the Powell speech that are also not reflected by the Tenet and McLaughlin statements in 2005. Furthermore, Tenet presided over the publication of a “white paper” in May 2003, written jointly by the CIA and DIA, which claimed that mobile weapons laboratories had actually been found in Iraq. That paper was demonstrably false on the basis of purely technical observations, (Note 15) and the attribution to CURVEBALL and several other hearsay sources was the same as in Powell’s speech. Within days the State Department’s Bureau of Intelligence and Research objected to the characterization of the trailers found as weapons labs, and they would be proved right. Tenet specifically denies learning anything about the discrepancies in CURVEBALL’s claims until early 2004. This excerpt of the so-called Silberman-Robb Commission, created by President Bush, focuses on Iraq’s biological warfare capabilities and places heavy blame on the intelligence community for having “seriously misjudged” that potential. The “primary reason for this misjudgment” was an over-reliance on CURVEBALL. Among other things, the excerpt cites CIA European operations division chief Tyler Drumheller’s account of meetings related to the issue that were held in January 2003 with CIA Director George Tenet and Deputy Director John McLaughlin, as well as e-mails and interviews from CIA officials aware of those meetings, and the dramatic February 4 phone call between the division chief and Tenet. The sessions, according to Drumheller, took place after he brought up German concerns over CURVEBALL’s reliability. Tenet and McLaughlin, however, denied any prior knowledge of these events a few days after the report was published. In his book, On the Brink, Drumheller asserts “there is a pile of documents two feet high backing up my story” (p. 205). John McLaughlin, former Deputy Director of the CIA, issued this statement on April 1, 2005, denying he had any knowledge of CURVEBALL’s status as a potential fabricator until late 2003. However, European division chief Tyler Drumheller has contended that he notified his superiors in October 2002 of the German government’s suspicions concerning the source, and then contacted McLaughlin’s office directly on the matter in January 2003. CIA Director George Tenet’s April 1, 2005 statement is his official denial of any knowledge concerning the mental instability or unreliable nature of CURVEBALL and the untrustworthiness of the intelligence he provided. He claims that he did not learn about any of these allegations until the publication of the Silberman-Robb Commission’s report on March 31, 2005. 1. 60 Minutes, scheduled for broadcastNovember 4, 2007, reported by Bob Simon. In Bob Drogin’s book Curveball: Spies, Lies, and the Con Man Who Caused a War (New York: Random House, 2007), the identity of the source is reported as Ahmed Hassan Mohammed, but the author notes that is not his real name. This text uses the Alwan identity put forward by CBS. 2. “Faulty Intel Source ‘Curve Ball’ Revealed,” CBSNews.com, Downloaded 11/2/07, 4:15 p.m. from www.cbsnews.com/stories/2007/11/01/60minutes/main3440577.shtml. 3. Secretary Colin L. Powell, “Remarks to the United Nations Security Council,” February 5, 2003 (Document 1 below). 4. “Report to the President of the United States” by The Commission on the Intelligence Capabilities of the United States regarding Weapons of Mass Destruction, March 31, 2005; and “Report on the U.S. Intelligence Community’s Prewar Intelligence Assessments on Iraq” by the Senate Select Committee on Intelligence, September 8, 2006. 5. The most recent account is in Karen DeYoung, Soldier: The Life of Colin Powell. (New York: Knopf, 2006), pp. 439-446. 6. The following account draws from the memoir of CIA European division chief Tyler Drumheller with Elaine Monaghan, On the Brink: An Insider’s Account of How the White House Compromised American Intelligence. (New York: Carol & Graf, 2006), journalist Bob Drogin (Curveball), and my own book Hoodwinked: The Documents the Reveal How Bush Sold Us a War (New York: New Press, 2004). 7. George J. Tenet with Bill Harlow, At the Center of the Storm: My Years at the CIA. (New York: HarperCollins, 2007), p. 379. 8. WINPAC appears to have taken a position similar to that of the Defense Intelligence Agency, whose view is that analysts are solely responsible for judging the bona fides of a source — essentially that if the information tracks with other material then the source is judged to be valid. 9. Tenet, op. cit., p. 379. 12. Silberman-Robb Commission, pp. 96-103. 13. Ibid., quoted p. 104. 14. Valerie Plame Wilson, Fair Game: My Life as a Spy, My Betrayal by the White House. (New York: Simon & Schuster, 2007), 128. 15. Prados, Hoodwinked, pp. 283-286. 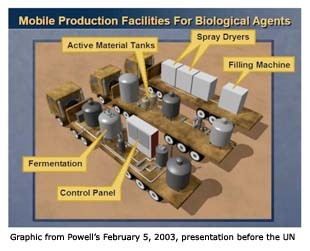 Additional detailed critiques on the mobile biological weapons production capacity assertions have been made by Dr. Milton Leitenberg and are available from the Federation of American Scientists, in 'Unresolved Questions Regarding US Government Attribution of a Mobile Biological Production Capacity by Iraq,' , 'Further Information Regarding US Government Attribution of a Mobile Biological Production Capacity by Iraq,' and 'Part III' of same.